If you were sitting at your desk this morning (payday!) and thinking to yourself, "What, oh, what should I spend my rent money on this month?" I have the answer for you. 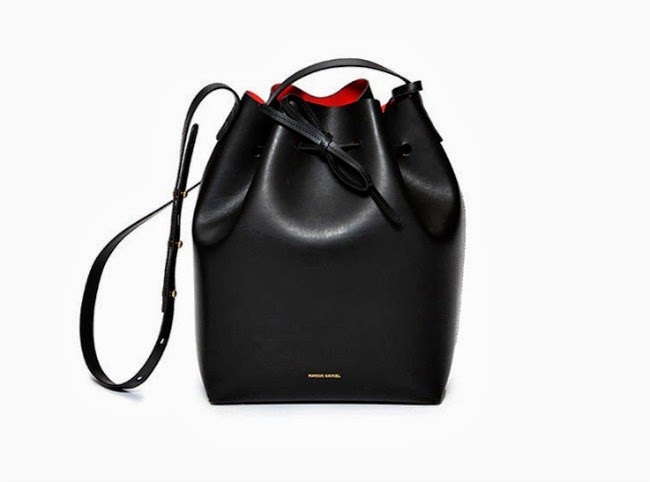 It is this gorgeous bucket bag from Mansur Gavriel. This small brand that makes leather totes, bucket bags and small pouches in forever chic shades of tawny brown and cognac and of course, black. Clean lines and a lack of fussy details make these the kinds of bags worth investing in—even more so than go-to bags like the Pashli, or even a Celine Luggage tote. Their notoriety proceeds them, and they will always be that bag everyone had for two years. Does that make them any less lovely and covetable? Not really—but at the moment I'm loving the simplicity of these covertly luxe carryalls.